In addition to taking the measurements of the proposed area for your new bathroom installation our experienced surveyor will examine the plumbing and waste services and gather as much relevant detail as possible about the construction of relevant areas of your home. With this information we will be able offer you accurate advice about possible layouts for your new bathroom or wetroom. We can also advise on whether it's necessary to alter or upgrade the existing plumbing services or structure to achieve your desired bathroom layout. During this visit we will also discuss the brassware, sanitaryware and tiling that you may be interested in (showing samples and providing literature where possible). 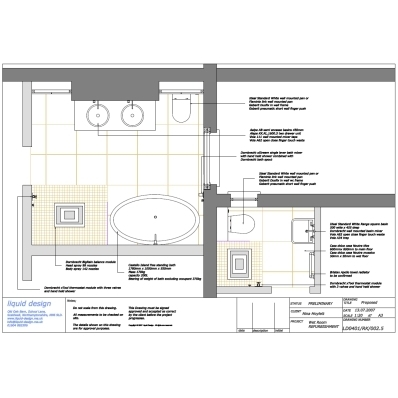 Following our visit we will produce detailed plans, sections and elevations for your proposed new bathroom or wet room showing the equipment and tiling layouts you are considering installing. If you are interested in having us install your new bathroom we will also prepare a detailed quote for the work.